Want to trigger one of the most revered producers’ drum sounds from your kit? Rock on! The Rock Foundry is a masterclass in rock drum sounds, and while many packs exist with a similar claim, this is the most all-round we’ve tried - dynamic, instantly useable and extremely versatile. Toontrack has long been known for its collaborations with household name producers and engineers, and it seems that the company has got this down to a fine art. Thanks to the already well-stocked range of products we have access to drum sounds recorded in the world’s greatest studios, using the best gear and, crucially, captured by ears of gold. 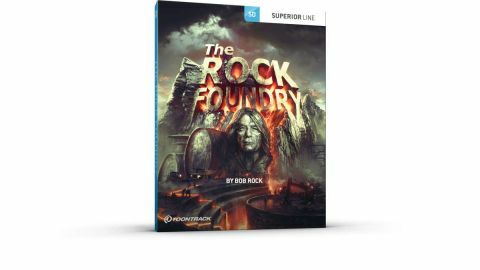 Following hot on the heels of the game-changing Superior Drummer 3 comes the latest - and undoubtedly to some - greatest collaboration to date, in the form of The Rock Foundry, produced by none other than Bob Rock. If you’re unsure of who Bob Rock is, take a quick look at the discography, which spans some of the biggest and most influential rock productions of the last 30 years: Aerosmith Permanent Vacation, Bon Jovi Slippery When Wet, Mötley Crüe Dr Feelgood, Metallica’s Black Album and many more covering everything from pop to modern metal. One thing that unites Bob’s production and engineering work is the phenomenal drum sound: huge ambient snares, powerful kicks and toms and an overriding clarity that means they not only cut through a mix, but punch you to the gut as they do so. You’ll need a copy of Toontrack’s Superior Drummer 3 in order to run them, but as seen in these very pages, Superior 3 is practically a must-have for serious e-kit users who want to record. The pack was recorded at The Warehouse in Vancouver (chosen by Rock himself), and features his tried-and-tested recording techniques. You get a mixture of seven kits, including a Yamaha Absolute Maple Hybrid, plus three 60s and 70s Ludwigs, and toms from Ayotte and Gretsch. One of these kits - a Premier 202 outfit - has been recorded in mono only, a technique that shows a different side to the bombastic production Rock is largely associated with. Equally impressive is the list of snares with sought after and rare models from Dunnett (titanium, bronze), Tama (bell brass) and Brady (solid-shell jarrah). Sonically, the pack is a rock fan’s dream. The sounds here range from vintage Bonham/Ward-style warmth, to punchy ambience in the style of the albums mentioned above, all the way up to seriously-cutting modern rock and metal sounds. One of the greatest things about The Rock Foundry is the fact that the sounds are there instantly. Whether you’re looking to jam with some of your favourite rock albums, apply their flavour to your own recordings or bolster your live sound with triggers, you’ll find it here.